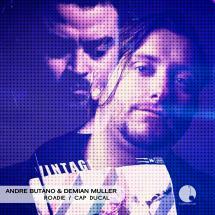 Andre Butano and Demian Muller, both hailing from Chile, come together for this super two track single release on Cadenza Lab. Having already recorded for labels like 8Bit, Melisma, Recycle and Cadenza, the pair craft a smooth couplet of tracks here. 'Roadie' is hypnotic and roaming deep house with a mesmerising salsa piano hook whilst 'Cap Ducal' ploughs similar territory with some straight up groovy house business, freestyle keys floating over a solid rhythm track and energetic percussion.